Danni Haebich is well-known throughout the Dimboola community for getting in and contributing wherever she can, and this ‘can-do’ attitude has seen her presented with the Hindmarsh Shire Council’s Young Citizen of the Year Award. The award was presented to Danni at this morning’s Australia Day ceremony by Hindmarsh Mayor Ron Ismay. “It is an absolute pleasure to announce Danni Haebich of Dimboola as the recipient of Hindmarsh Shire Council’s Young Citizen of the Year,” Ron said. Danni managed to juggle school and community roles throughout 2018, all while completing Year 12. Danni was a member of a four person team who recently completed a 30km walk along South Australia’s Fleurieu Peninsula to raise funds and awareness for Beyond Blue. The Dimboola team raised over $2,000 and plans are in place for another trek during 2019. 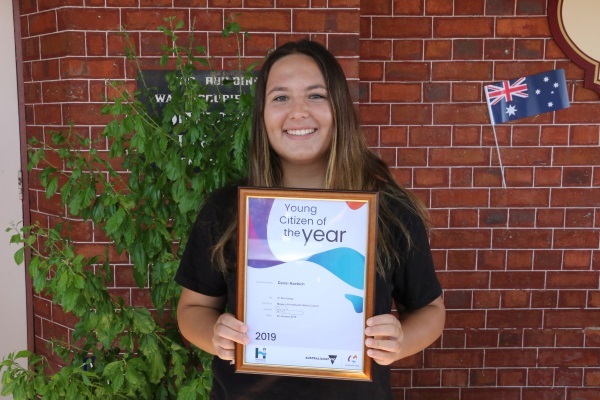 “As a result of her winning the Victorian award, Danni is now in the running for the Keep Australia Beautiful, 2019 Young Legends awards and on behalf of all Hindmarsh we wish her all the best,” Ron said.